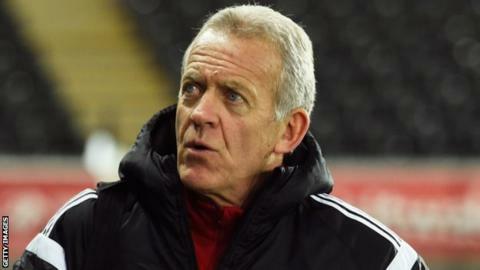 Alan Curtis says he would be willing to step aside if Swansea City found a new manager before the end of the season. Curtis, 61, is in charge until the end of the campaign after Swansea failed to find a long-term successor to Garry Monk. Swansea are a point above the drop zone and Curtis says he would not have a problem stepping down. "I've got no sort of vanity (that I must) be here until the end of the season," he said. "I'd expect to be here until the end of the season, but if results go against us and the club deem it that they need to bring someone in at short notice, then so be it. "We've worked hard to get into the Premier League. It's important we stay here not just for next season but for seasons to come as well." Curtis was appointed until the end of the season after picking up five points from five games as caretaker following Monk's sacking on 9 December. But Swansea have since been knocked out of the FA Cup and were beaten 4-2 at home by relegation rivals Sunderland on Wednesday. The former Wales striker does not think the Sunderland defeat will have a long term impact on Swansea's bid to stay in the Premier League. "There was a bit of anger, if anything, after the result on Wednesday," Curtis added. "I would hope they would want to right the wrongs, they felt a couple of decisions went against us. They are a strong group and you look to the leaders of the group like Ashley Williams. Leon Britton and Neil Taylor. "They're the type of people who will come forward for us."